Web of Conferences, managed by EDP Sciences, is an open access platform devoted to the publication of scientific conference proceedings. The platform offers high quality services for the publication and dissemination of conference proceedings in the areas of Physics & Astronomy, Engineering & Technology, Health Sciences, Biology, Chemistry, Mathematics and Computer Sciences. 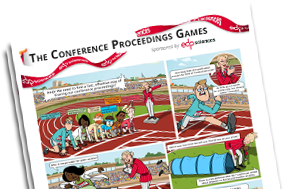 Need help finding a fast, effective way of sharing your conferences proceedings ? We were pleasantly surprised by attention paid to the quality of submissions, useful and clear guidelines and high efficiency with which the team of the SHS Web of Conferences (EDP Sciences) works. For us, it is an indisputable indicator of high professionalism. We are grateful for this cooperation, the opportunity to publish scientific research results of our authors in Conference Proceedings of such a high level. Thank you for this experience, your kindness and patience! We have a very good publishing experience with you and the working efficiency is high! All of you are very nice! The conference will be held every one or two years in the future. Looking forward to the future cooperation!